May, the month of the colour and splendour of Chelsea Flower Show. It’s also the time when you’ll probably be joined in the garden by some unwelcome companions. 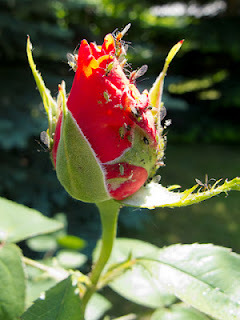 Greenfly – aphids are likely to arrive in numbers. There are plenty of proprietary sprays available but two you can make yourself and go organic are tomato leaf spray and garlic oil spray – you’ll find recipes online. Slugs are on the march to attack seedlings, your lettuces and delphiniums. Again, there are some natural, non-toxic methods of slug control. Another busy month. Herbaceous plants are growing fast and will benefit from fertilising. If you like summer bedding the beds or areas between shrubs and herbaceous plants need forking over and weeds removed. Most summer bedding plants prefer poorer soil so not too much spreading of fertiliser into those areas to be planted. Don’t plant out too early in May, harden them off and let the soil warm up. Thin and stake herbaceous perennials. Plant dormant dahlia tubers in the border, well covered with soil to protect against frost but growing plants must wait until the first week of June to be safe. Plant out hardy chrysanthemums. Feed daffodils – don’t cut or knot the leaves, the bulbs need the foliage to build for next year. Most tulips are better dug up and stored indoors. Treat weedy lawns.